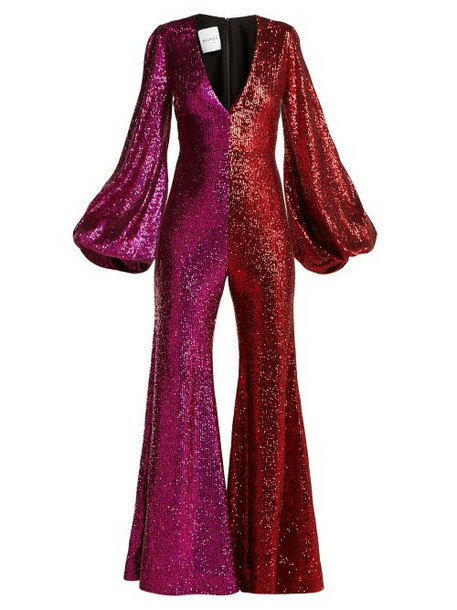 Halpern - Halpern's ready-to-wear offering has swiftly reached cult status and this pink and red sequinned tulle jumpsuit illustrates why. It's made in the UK for a slim fit with a plunging V-neckline and oversized bell sleeves - dramatic details the founder developed when at Versace - then falls to wide, flared legs. Heighten the retro disco-ready feel by styling it with stiletto heels and statement earrings.